A 13-year old boy was crushed to death by a speeding private bus on the Amritsar-Jhabal road area here today. The situation became tense when residents thrashed the accused driver of the bus identified as Bachiter Singh. In another blatant example of the use of domestic LPG cylinders for commercial purpose, food and snacks cooked using domestic cylinders are being sold at Amritsar Shopping Festival at Ranjit Avenue. The use of domestic LPG cylinders for commercial purpose violates Liquefied Petroleum Gas order 2000. Beas police falling under Amritsar rural police district has booked about eight persons, including Kashmir Singh, a resident of Vazir Bhullar and Malkeet Singh of Bhakna village on charges of illegal mining the sand from the Beas river bed besides obstructing the government employees from discharging their duties. Amritsar rural police has booked a ration depot holder in Nijjar village along with the driver of the vehicle and a karyana store owner for selling the kerosene oil in the open market. A case under Section 7 of the Essential Commodity Act and Section 420 of the IPC has been registered against the accused. With the arrest of two persons, the city police today claimed to have busted a gang of robbers which was active in Amritsar and its adjoining districts. However, two of their accomplices managed to escape from the spot by dodging the police. As the passion for kite flying blinds enthusiasts to all safety rules, it is the negligence on part of the district administration as well as the police which makes the problem worse. The holy city has been a hub to nurture literary talent since the time of Bhai Vir Singh and ever since clung on to its literature. Not only it has grown in impact, its respect and status remains unchanged. The implementation of the Right to Service Act is far from reality at the District Transport Office in Amritsar. With the office making half-hearted attempts, the Act, which makes services time bound, has failed to serve its purpose. Like any other popular award function, this one too had lot of glitz and glamour. The Punjabi Film Festival held at Sri Guru Harkishan public school on Saturday evening had the who's who of the Punjabi entertainment industry walking the red carpet. As garbage spillage continues at Bhaktanwala dumpyard, there seemed to be no immediate respite for residents. Meanwhile, the Amritsar Municipal Corporation has fixed March 9 to conduct a public hearing over the issue of proposed integrated municipal solid waste management plant at Bhaktanwala. Residents were going to set the bus (PB-02-22-9968) on fire when the police intervened and arrested Bachiter. A case under Section 304 IPC (unintentional murder) has been registered against him on the basis of the statement of Rajinder Singh, uncle of the deceased. The victim identified as Gora was going towards his residence near Bedi petrol pump on Jhabal road. Eyewitnesses said, the boy fell before the bus and was crushed to death. Sushil Kumar, SHO Gate Hakima police station said the situation became very tense as the residents of the area claimed that they had warned the accused driver of negligence in driving a number of times. “Moreover, he had the license of driving light vehicles only. We will seek a report from the DTO in this regard,” he said. The victim, identified as Gora, was going towards his residence near Bedi petrol pump on Jhabal road. Eyewitnesses said, the boy fell before the bus and was crushed to death. As many as 120 stalls were set up at the five-day shopping festival to conclude on Monday. 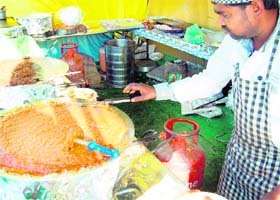 Of these, some are food stalls serve freshly cooked food and snacks like paav bhaji, aloo tikki, vegetarian kaleji etc. Even as the objective of the festival and the stalls set up here was purely commercial, but the organisers failed to procure commercial LPG cylinders to cook snacks and various food items. All eatables are being cooked on domestic cylinders. Many commercial establishments, including rehriwalas and sweetmeat shops, use domestic LPG cylinders to reduce the cooking cost as a kilogram of commercial LPG costs over Rs 52 whereas a domestic LPG is available at Rs 30 per kg. Reports say a domestic LPG refill is being sold at Rs 550 and above in the black market by people allegedly hand in glove with the various gas agencies in the city while in case of any emergency the rates shoot up. Residents of several areas in the city are already complaining of the shortage of domestic LPG cylinders. Many areas also registered public protests by its residents. Agitating residents held the shortage of LPG gas cylinders to their “black marketing” and said the consumers were to wait for at least 15-20 days for the refill. It prompted the Deputy Commissioner Rajat Aggarwal to direct the District Food and Supply Controller Dr Rakesh Kumar Singla to conduct raids and put the supply chain of refill in order. Limited supply, rise in the use of LPG due to the cold weather conditions and diversion of domestic to commercial were found to be the reasons behind the present scarcity, said Dr Singla. When the violation was brought to the notice of the District Food and Supply Controller, Dr Rakesh Kumar Singla, he said he will soon dispatch a team of the department to stop the violation. He said as per the Liquefied Petroleum Gas order 2000, 14-kg domestic LPG cylinder could only be used in a kitchen at a house and using it for any other purpose outside it (house) amounted to the violation of the order. He said as per the order, domestic cylinders of the violators can be confiscated. Besides, the department was empowered to get an FIR registered against the violators under the Essential Commodities Act. Prem Sharma of Future Optimistic Group Future Optimistic Group organiser of the event said he was not aware of domestic LPG cylinders being used instead of commercial and added that corrective measures will soon be taken to correct the anomaly. Palwinder Singh, a driver with the district industrial (mining) department, in his complaint to the police alleged that the department got a tip off that the accused were involved in illegal mining of sand from the river. He said he along with the senior officials of the department, including Krishan Lal Bhagat, Tejinder Singh ad Ravinder Kumar reached the spot at Vazir Bhullar in their government vehicle. He alleged when they tried to stop the accused, they thrashed them and interfered in discharging their duties. Beas police has registered a case under Section 379, 332, 353, 186, 506, 148, 149 of the IPC in this connection. The police said the accused Jaspal Singh, the depot holder, was allegedly involved in selling of kerosene oil in the open market, including karyana stores in the area. He had not been disbursing the oil on the pretext that the code of conduct was in force, the police said. The police authorities got the information that he was going to sell the kerosene oil to Janak Raj Karyana store in the area in two drums. A police team from Khilchian police station recovered a drum containing 400 liters of kerosene. The police arrested the driver identified as Balraj Singh. Sardool Singh, the investigating officer said the other two accused Jaspal Singh and Janak Raj have been absconding since the registration of the case. A case under Section 382, 411 IPC and 25/54/59 of the Arms Act has been registered against them. They were taken on police remand. The accused have been identified as Birpal (22), a resident of Bhai Lalo ji Nagar and Baljinder Singh (24) of Vallah village. Bablu of Ekta Nagar, Chamrang Road and Dara Singh of Fateh Singh Colony who managed to flee from the spot. The accused were arrested near the T-point on the GT Road with a car bearing (PB-02-AM-5911). During search of the vehicle, the police recovered a country-made pistol (.315-bore), sharp-edged and blunt weapons besides six mobile phones. Investigations revealed that the accused admitted to have committed a dacoity at Kamal Vihar, Jalandhar, wherein they had looted Rs 3.25 lakh besides gold ornaments on August 2011. 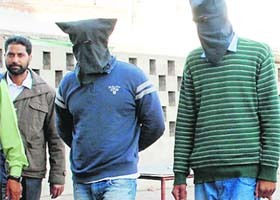 The Jalandhar police had already nabbed three of their accomplices involved in the crime, including Vishal Lota and Prince both residents of Jalandhar and Vijay Kumar of Amritsar. The police authorities said they were investigating who is the real owner of the car while teams have been dispatched to arrest the other accused. Meanwhile, the city police also arrested Rahul Kumar (23) of Pawan Nagar and Sohan Singh (26) of Anand Nagar and recovered a number of household items from their possession. They were arrested near Chalils Khuh, Jora Phatak. The accused stole the material from the residence of Ashu Mahajan, a resident of Shiva Enclave. The police recovered the material from the residence of Rahul. A case under Section 457, 380 of the IPC has been registered against them in this regard. The police authorities said Sohan was already wanted by the police in as many as seven cases four of which were registered in Civil Line police station and three in Islamabad police. 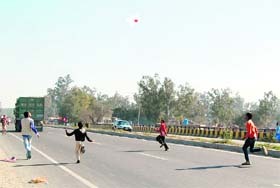 With their eyes on the sky, youngsters chase the kites not realising if they are risking their own lives as well as that of other commuters to grave danger by running on the busy roads. Similar scene was witnessed today at Vallah where scores of people were spotted flying kites on the Amritsar-Attari bypass road (near Vallah village). In their excitement children were seen running to catch the snapped kites unmindful of the speeding vehicles on the road. Ironically, the Vallah police post is located just a few yards away from the spot even as the policemen on duty here look the other way. The occasion was ‘Kotha Sahib Vallah Da Jor Mela’ being held on the road side and kite flying enthusiasts were the part of this fair which will continue till March 6. What prompts them to run on the busy roads, these kite flying enthusiasts say farmers do not let them enter their fields because of the fear of having their crops destroyed. “We have no other place but this road which is a public place where no one intervenes,” says one. Besides the youth chasing kites, the road users particularly the two-wheeler riders face the risk of getting their throats slit by maanja (kite string). Many instances in the past are proof of this. The enthusiasts mix a variety of ingredients, including glass pieces, powder from used battery cells, and other chemicals in the locally-made manja as well. This thread is either being pulled very quickly or hangs in the way resulting in grievous injuries to anyone crossing its path. In the holy city, Punjabi poetry still exuberates beautiful, exciting and traditional optimism. Considered one of the most celebrated places in poetic history, Amritsar has enjoyed the deep insights of its past and fresh energy of its new generation of poets. “Amritsar has enjoyed a strong presence of vernacular literature, whether its poetry, writing or otherwise. Most artistes in its history came from the roots of rural Punjab and this connection refuses to die,” says Parminderjit Singh, poet, writer and editor of Akhar, a prominent literary journal in Amritsar. That is the reason why regional literature still holds strong. “Contrary to belief that Punjabi literature has few torchbearers left, the new crop of Punjabi poets and writers are making their presence felt with quality work. I have stood amongst stalwarts like Gurbuksh Singh, Santokh Sheriyar and now I see budding poets like Tejinder Bawa, Preetpal Kaur and Kamal. This shows that Punajbi literature has a good future like its glorious past,” he says. Indian literary society is rising to new levels each year with increasing list of bestsellers and Booker nominations, which reflects in Punjabi literature as well. 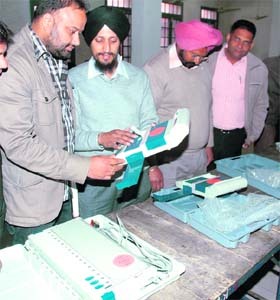 “A lot of writers and poets from Amritsar are travelling abroad with their works. Thanks to some NRI patrons, there is a huge market for Punjabi literature overseas. 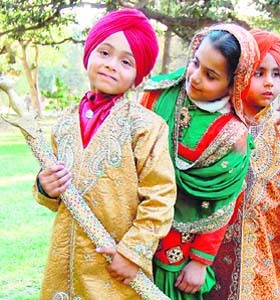 Large number of Punjabi works is being translated throughout the world into many languages. Also, Amritsar has been a breeding ground for vernacular literature as there is a favourable environment,” shares Tejinder Bawa, a budding Punjabi poet from the city. Local resident Sanjay Sen Budhraj’s case provides an example that how it works at the transport office. Instead of getting his renewed driving licence within 14 days of submission of application, Budhraj hasn’t got his work done even after 2 months. He then visited the office on January 24, but then too he was issued another slip, which was valid till February 25. He said the transport office authorities told him that he would be issued a smart card and hence the delay. District Transport Officer Vimal Setia said he would be able to comment on the matter only on Monday after going through the details. 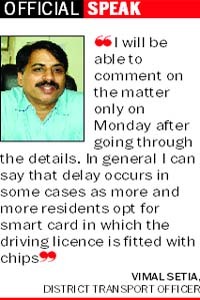 He admitted that the delay occurs in some cases as more and more residents opt for smart card in which the driving licence is fitted with a chip. He said the Right to Service Act specifies that the licence was to be delivered within 14 working days. He said for timely services, the number of window counters has been increased from two to four. He said more persons have been employed under the Punjab State Transport Society. Like any other popular award function, this one too had lot of glitz and glamour. The Punjabi Film Festival held at Sri Guru Harkishan public school on Saturday evening had the who's who of the Punjabi entertainment industry walking the red carpet. The fifth edition of the Punjabi Film Festival celebrated and honoured the best entertainers and talent in the industry. Navtej Sandhu, the organiser of the event had it all in place. "Bollywood and even television has its award nites. So, why should Punjabi entertainment industry, which caters to a good number of audiences in the region, be denied one? The idea of having our own award nite has been received with applause from audiences and industry insiders." The evening started slow on pace, with stars shining bright as the night graduated. 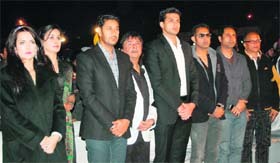 There were vibrant performances by Harbhajan Mann, Sardool Sikandar, Amar Noori, Firoz Khan, menu sehgal and Yuvraj Hans. The special attraction of the evening was a documentary on singer actor Harbhajan Mann's life. He was also honoured with special award of Living Legend of Punjabi Cinema. Apart from the glamourous nite, the Punjabi Film Festival didn't have any film screening. "We conceptualised the event to popularise Punjabi cinema, but over the years realised that people are not interested in watching films here, but the grandeur of an award function. So we don't screen films anymore," said Navtej. Navtej further says, "We don't involve any government or other body into the event undertakings. We don't give awards as there are no nominations, categories and controversies but honour the artistes." Sardool sikandar and Amar Noori were given Goonj Punjab Di, Lakhwinder Wadali received Soofi Sitara, Balraj Sahni honour for actor and actress went to Tulip Joshi and Gippy Grewal. Jaswinder Bhalla, Sardar Sohi, Beenu Dhillon and Sunita Dhir were also honoured for their contribution to the Punjabi cinema. Yuvraj Hans was given award for best debutant and singer Firoz Khan too received honour for his singing talent while music director Jaidev was honoured for his music. Since there are no nominations and categories for the event, Navtej said the absence of a jury avoids the controversy. "We hold the event on non-commercial grounds, so we have a team to research and jot down the names of the winners. We also take feedback from the public through Facebook and SMS." The officials of the AMC, who are awaiting court directions regarding the dispute arisen over awarding the work, said the public hearing has been scheduled to complete some official formalities. At present, an open space at Bhaktanwala, which has been designated as dump yard to absorb the city's refuse (300 metric tonne of waste on a daily basis), has outlived its capacity. As a result of which, the garbage spills on the roads. Consequently, about 30,000 residents settled near the dump yard are forced to live under most unhygienic conditions. Many residents have developed respiratory problems. Meanwhile, the MC is facing a tough time managing the heaps of garbage, mounting with each passing day. But in the absence of adequate arrangements for dumping the garbage, the waste has made its way to residents' houses, their place of work and their fields. So pathetic is the situation here that all sides of the grain market, which has 60 shops, have been covered with garbage. Meanwhile, the solid waste management project could not see light of the day even after two years. A Mumbai-based AKC Company had filed a writ petition in the court against the authorities for refusing to award it the job, and the final decision of the court is still awaited. While MP Navjot Sidhu and MLA (Amritsar South) had announced to erect a wall around the dumping site, but nothing has been initiated yet. In Amritsar, the garbage processing idea was conceptualised in 2007 and with the 20 per cent grant-in share amounting to Rs 16 crore, a Mumbai-based company Antony Waste Handling Cell Private Ltd was entrusted with the task of lifting 300 metric tones of garbage, excluding the walled city in 2009, for the first phase of the solid waste management project to lift the garbage to Bhaktanwala dumpyard. But the second phase of the project, wherein a solid waste management plant was to be set up for processing the garbage, hangs in balance because another Mumbai-based company AKC which was allotted the work. But the company approached the Punjab and Haryana High Court after the allotment was later cancelled.